Watching The Sense of an Ending, I was struck by the realization that this should have been a good movie. Unfortunately, as is too often the case, something didn’t translate from the written page to the big screen. The source material, Julian Barnes’ lauded 2011 novel (which won the Man Booker Prize), is transformed (despite the efforts of a fine cast) into a muddled, lukewarm melodrama whose moments of power are few and far between. The film’s structure is suspect and its ability to develop a bond between the viewer and the characters is strained by the existence of too many flashbacks and extraneous subplots. The revelations that underpin the final act feel strangely anticlimactic and the ending isn’t nearly as satisfying as we suspect it should be. The film’s primary timeline occurs in the present and follows the day-to-day activities of Tony Webster (Jim Broadbent), a retired camera salesman. Circumstances result in his reconnection with a girlfriend from decades ago, Veronica Ford (Charlotte Rampling). Her mother, Sarah (Emily Mortimer), has recently died and bequeathed a diary to Tony - a memento Veronica is unwilling to release. The prospect of meeting Veronica after so many years stirs up memories and we gradually learn the details of their love affair, including the bitterness that accompanied its ending. In the process, we meet Veronica’s mother and Tony’s best friend, Adrian Finn (Joe Alwyn). During a series of encounters, Tony opens up to his ex-wife, Margaret (Harriet Walter), with whom he is still friendly, about these old wounds. At the same time, he prepares to help his soon-to-be-single-mother daughter, Susie (Michelle Dockery), welcome her child into the world. There’s nothing terribly wrong with The Sense of an Ending. It’s serviceable melodrama with occasionally amusing bits of comedy and a series of effective performances. But it has no heft. It’s forgettable and that’s a shame because, by all accounts, “forgettable” isn’t a word anyone would use to describe the novel. Indeed, watching the movie, it’s possible to sense that something more profound is struggling to escape but that screenwriter Nick Payne just can’t bridge the gap. There are two impediments to the viewer’s ability to engage with the story. The first is the manner in which it is presented. The frequent flashbacks, although designed to gradually unveil the past, result in a disjointed narrative. Part of the problem is that the actors playing young Tony and Veronica - Billy Howle and Freya Mavor – bear little resemblance to Jim Broadbent and Charlotte Rampling. It’s difficult to accept that these are the same characters separated by several decades. Beyond the film’s structure is the haphazard manner in which the subplots are handled. Tony’s involvement in Susie’s pregnancy, for example, seems like a bit of “color” shoehorned into the script rather than an integral part of the story (which I suspect readers of the novel will argue it is). In and of themselves, Broadbent and Rampling add an element of class to the proceedings. Both are seemingly incapable of giving a bad performance and, to the extent that we identify with Tony and Veronica as real people rather than a writer’s constructs, it’s more likely attributable to the actors than the material they’re working from. It’s unfortunate that The Sense of an Ending has been accorded a mediocre screen adaptation. This isn’t unusual for literate properties. Many of the richest, most compelling novels have bedeviled screenwriters and directors and, in retrospect, the movies should never have been attempted. 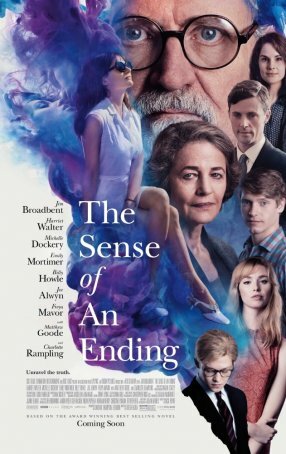 The Sense of an Ending isn’t as bad as all that but there’s nothing about this production to suggest it’s worth seeing in lieu of reading the book. Watching The Sense of an Ending is a disposable experience easily discarded.